If we just remember Krishna at the time of death, for sure we attain Krishna. Therefore, if we are complacent, we won’t prepare ourselves; but your state of mind is you are actually concerned. So we prepare ourselves in our life for that final exam by taking shelter of Satsaang, association of devotees, by taking shelter of Srimad Bhagvatam – not just reading as a scholarly study, but taking shelter. This type of enthusiasm is inspired by the shelter that we feel that we desperately need. If we don’t feel that serious need then we don’t take shelter; you can’t take shelter in a complacent mood; you can’t take shelter when you feeling solace from so many other things. So actually the intensity of the feeling of your heart is the solace that Krishna is giving you. The Srimad Bhagvatam is the solace, the holy name is the solace, our seva is our solace, the holy name is our solace and the fear, the concern in your heart is an impetus for us to take shelter of the real solace. Vishvanath Cakravarti Thakur explains the six children that were killed by Kamsa; they are called sat-garbhas. The great son of Brahma Marici, he had six children and they committed an offense to Lord Brahma. Therefore they were cursed to take birth in the family of demons. Later on they were cursed to be killed by their own father – in their past life – and he would become Kamsa. It’s a long story: they became the grand sons of Hiranyakashipu. Yes. And they went and did tapasya and got blessings, and Hiranyakashipu was so angry with them because they didn’t get his blessings before going to get the blessings of Brahma. So he cursed them. Ultimately these six children, their only purpose is they just wanted to get out of the way these curses and go back to their position as devotees which they did. And they got ultimate spiritual perfection through this process. But Marici represents the mind and the six children represent the six enemies of the mind, lust, anger, envy, arrogance, greed and illusion. And they must be killed for the mind to become purified. Balaram represents the original Guru who actually prepares the mind and the heart for Krishna’s arrival. Kamsa represents fear of material existence and Devaki represents a devotee. 34 Responses to "Real solace is in taking shelter of Krishna"
With complete faith in Lord, we can have complete dependence on God. Only in such situation Lord protects us from all situations. If we can follow it in our daily life, it is sure that we can remember the Lord at the time. It’s only when we are helpless and in distress that we can take shelter of the Lord. If we unconditionaly take shelter of Krishna the fear of Material existence will be eradicated. True. This healthy fear is very much needed for spiritual progress. Thanks Radhanath Swami. So true. Lord Krishna is so merciful He incarnate in this kaliyuga in the form of Holyname to bestow His mercy. ‘Kali kale namrupe Krishanar Avatar’ still I don’t have attachment for it. This article touches deep inside and gives nectar of wisdom that by taking shelter of Holyname, Shastra and Satsanga is only solace in this world. Right. We really get solace as soon as we pick up Bhagavad Gita, Srimad Bhagavatam or any other scripture or taking shelter of Lord’s holy name or in the association of devotees. Thanks Radhanath Swami. Unless we take shelter of Krishna, there is no hope as every other shelter ultimately becomes shelter less themselves. Taking shelter of Krishna is the only solace of this temperory material nature. Agree. Lack of sufficient fear and trying to take temporary solace of the things of this material world are the reasons why we are not intensely eager to take shelter of Krishna. True. Thanks Radhanath Swami for giving proper diagnosis of the problem faced by all the spiritualists. Very nice article. Thank you very much. Taking shelter of holy name brings us more closer to Krishna. Supreme Lord Krishna, who is also eternal and blissful. Very nicely explained by Maharaj. “We take shelter of the holy name not only because we are supposed to do it, but because Krishna is there to give himself to us in his name” – what a profound statement! We should take shelter of the Lord through his holy names as Krsna is personally present in his names. 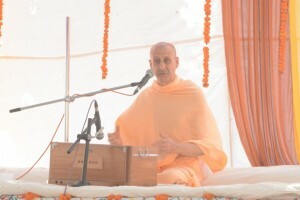 “We take shelter of the holy name not only because we are supposed to do it, but because Krishna is there to give himself to us in his name.” Very deep statement by HH Radhanath Swami.The earliest we realize this statement and act upon it by taking the shelter of Harinam in that consciousness that Krishna is there to protect us ,as Maharaj says here, that quickly our miseries will get mitigated. Very nice lecture. Thank you very much for sharing the same. Very useful guidance on the process of Surrender. Life is preparation and death is the Final Exam. Thank you for publishing this wisdom from HH Radhanath Swami. So true unless we are seriously taking shelter, it will not help. 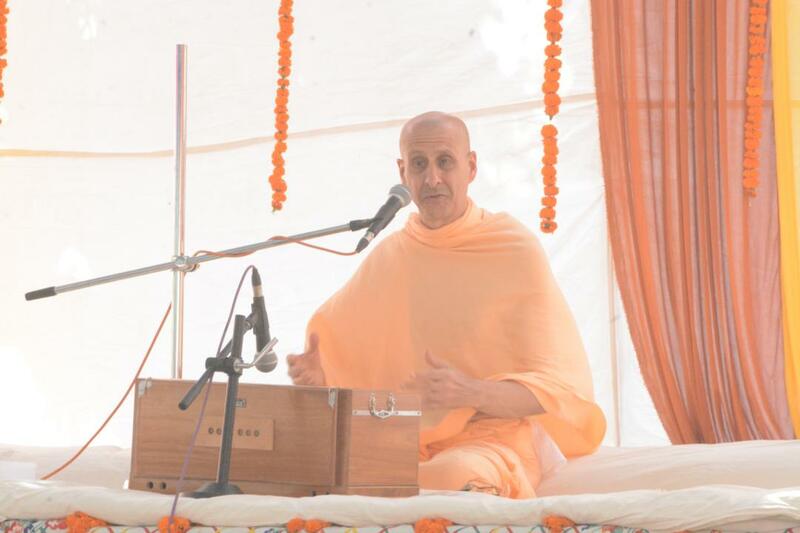 An eye opening message from HH Radhanath Swami Maharaj. True, we take shelter of the Lord when we are desperate and in dire straits. So we should be happy if we have troubles so that we can intensely take shelter of the Supreme Lord. A very bold and courageous statement :). May Lord give you his constant remembrance and shelter, without any troubles in executing Devotional Service to Him. Beautiful description that inspires us to have healthy fear of Maya always in our heart! “We take shelter of the holy name not only because we are supposed to do it, but because Krishna is there to give himself to us in his name” – what a statement. I believe currently we are (at least I am) just chanting because we are supposed to. we should develop our consciousness so that we should be scared of maya and should really take shelter of the Lord while chanting and in every circumstances. Thanks Maharaj for making us realise this. An inspiring comment. Thank you.